Is your garbage disposal malfunctioning? Don’t let a faulty disposal clog your drains. Call your Annapolis garbage disposal repair team at (410) 268-7191. We have a fast solution for you. Click here to view current specials and discounts. An efficient garbage disposal helps keep your drains clear and allows you to avoid foul odors in your trash can. When your disposal starts to malfunction, however, your kitchen drain may clog from the items that fail to shred. If this is happening in your home, contact your Annapolis garbage disposal repair experts at Heidler, Inc. for immediate service. 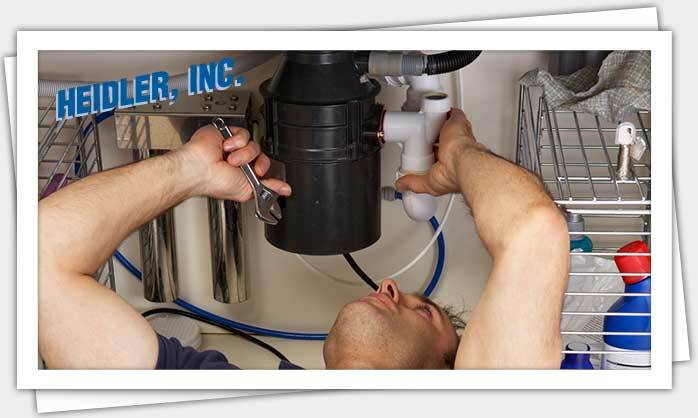 We have helped customers throughout Annapolis get their garbage disposal back in order. Read their reviews here. We want you to be our next success story. Burnt out motor: This is often due to age or a unit that has overworked itself. The motor may simply shut down and stop working entirely. This will usually require a replacement. Broken blades: Hard to shred items can damage your disposal’s blades. This can significantly reduce the efficiency of your unit. Jammed disposal: Food may be lodged near the blade, preventing it from rotating. This leads to drain clogs as food items that fail to shred properly build up in your drain. If you are experiencing any of the above problems with your garbage disposal, we can unjam the existing unit or replace it with a new garbage disposal. When should you repair vs. replace? A garbage disposal is generally one of the most affordable appliances in your home. You may be wondering if it is more cost-effective to simply replace it instead of repairing it if there is a problem. Many disposals can be restored to normal operation by unjamming them, provided the problem is not too extensive. However, there are instances when the disposal is no longer functional and a replacement is necessary. If your unit needs constant repairs, it will prove more cost-effective to replace the entire unit with a more efficient one. When you call us for an inspection, we will present you with options for repair or replacement so you can make the best decision. What are easy disposal maintenance tips? There are several tips you can follow to enjoy extended efficiency from your garbage disposal. If your disposal has stopped working, press the red reset button located on the exterior of the unit. This may remedy the situation. To prevent clogs, only place small amounts of food into the disposal at a time. Avoid placing potato peels, pasta, banana skins, meat bones, oil, grease, coffee grounds, fibrous vegetables, eggshells, and other hard to shred items in the disposal. However, we recommend grinding ice cubes to scour your disposal’s walls. Grind citrous peels to keep your drain smelling fresh. Run your disposal on a regular basis. This will help prevent rust from developing in the unit, while also making sure blockages don’t build up. Let cold water run while your disposal is working. This prevents the motor and other components from overheating, while also helping to push the waste down the drain. Are you looking to install a new garbage disposal in your Annapolis home? Do you need to repair the unit you currently have? Call us at (410) 268-7191 for flat rates and solutions you can trust.